Q.1. 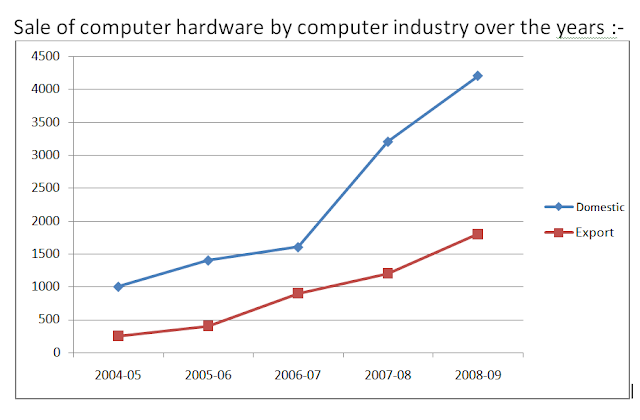 What was the difference between the total hardware sale in exports sector in 2005-06 and 2006-07 together and hardware sale in domestic sector in 2006-07? Q.2. What was the difference in the average sale of hardware between the domestic and exports sector? Q.3. Approximately what was the percentage increase in the sale of hardware in domestic sector from 2006-07 to 2008-09? Q.5. In which of the following years was the percentage increase in sale of hardware in domestic sector maximum over the proceeding year? Sir please upload sbi mains study plan especially for GA section and i want to know expected cutoff for general category in sbi pre .. Chance nikal aaye tab regret karna hain kya?? sir, none of my answers are matching ur solutions.... how should we solve such ques when they are asked in xam, in case there is unspecific scaling? What is "Import Export" if you are using Domenstic and International Sales in the questions. it creates confusion. Thank you Sir ! You always take care every query.